It’s now two weeks since I started the Sampler Aux Bouquets by Nathalie Cichon of Jardin Privee, it’s progressing really well, I’m amazed how much I have done so far. I’ve stitched nearly 20cm of the design, which is over a fifth of the sampler. At this rate I might even get it finished for Christmas…though I’m not promising to keep going at this rate of knots! 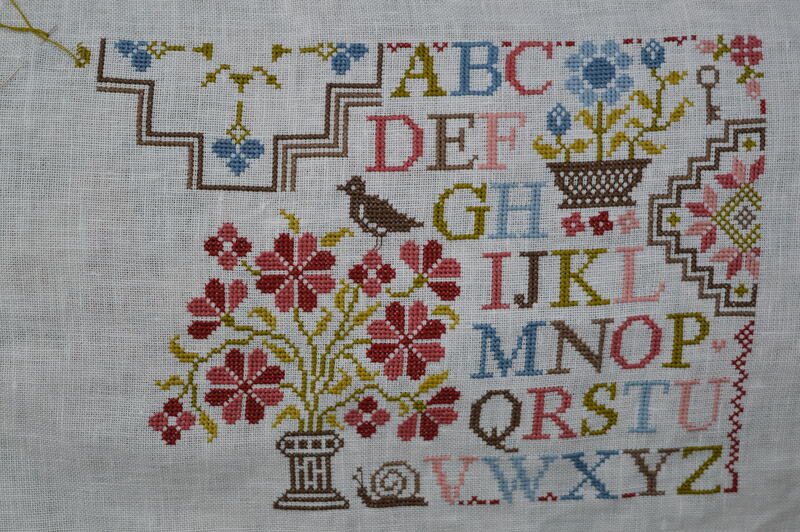 I’ve completed the alphabet which first attracted me to this sampler, I love the way it drifts down the sampler with a mix of colours. Two of the ‘bouquets’ are also stitched with a third on its way. I’ve got a few little creatures to stitch next, squirrel, rabbit, beetle and a bird. 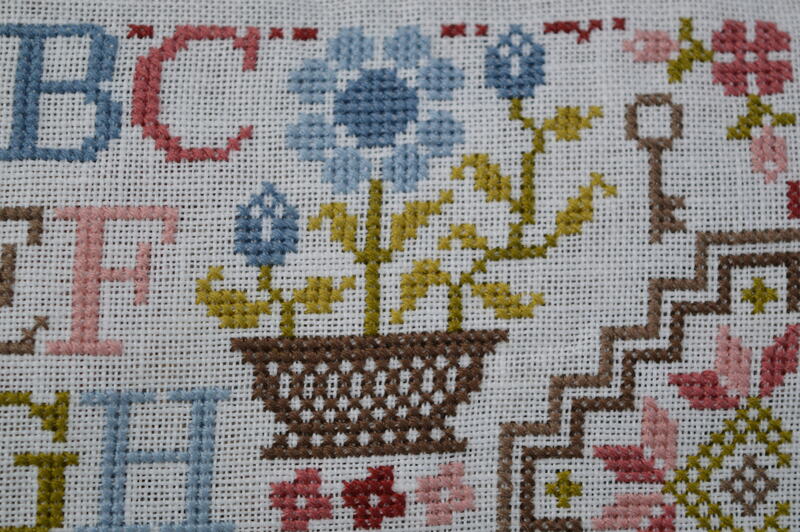 The colours in this sampler are gorgeous, almost Jacobean, rich blues and pinks with greens and browns to soften it. This sampler is actually three patterns stitched as one, I’ve started on number three and Nathalie gives extra pattern sheets for the joining area, so I’ve got to be careful which bits to stitch and where to stop. By next week I might even be on number two! I’m linking up with Kathy’s Quilts for Slow-Stitching Sunday and Super Mom No Cape for Vintage Embroidery Monday, why not have a look and see what hand-sewing everyone else is doing. This entry was posted in Crafts, Sewing and tagged cross-stitch, Jardin Privee, sampler, Sampler Aux Bouquets. Bookmark the permalink. This is really a beautiful sampler. I love looking at needle point but haven’t done any in many years. Thank you Jeanna, I didn’t do any cross-stitch for years, but I’ve got back into it this year! Beautiful sampler. I am looking forward to watching it grow. This is so beautiful and a lot of work. I haven’t done any cross stitch in a long time, but know it is a very slow process. GREAT job! Thank you Jennifer, it’s a slow process, but it’s quite addictive too! This is beautiful. I feel inspired to pick up a piece I abandoned years ago. It’s just lovely! It will be a stunning finish! Thank you, I’m enjoying stitching it, I think it’s going to take a while though! That is beautiful! I’ve never seen that pattern before. 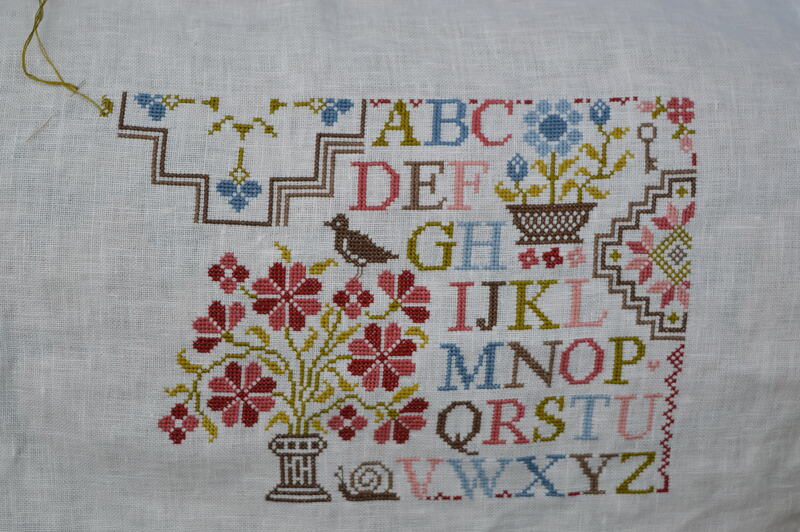 Your work on this sampler is just gorgeous! That looks great! I love the colors! I am visiting you from Super Mom – No Cape’s, stitchery party. Your cross stitch is looking fantastic. I have just picked up some cross stitch I had put away 10 years ago and am hoping I will finish it this time (although my post this week is not on cross stitch). Do you stitch your work in a frame, I do and am finding it is hurting my thumbs – maybe that was why I stopped last time. Hope you have a good week stitching. I think I shall have to look into getting a Fanny Frame, if it will save my thumbs! 😀. Thanks for the advice. Oops, that’s Fanny Hoop, of course! You have sure made a lot of progress on this. There are certainly a nice variety of patterns to stitch to help keep your interest. Thanks for linking up again to this week’s Stitchery LInk Party and for the link back. Aloha hugs!